October is a Fine Fall SoCal Planting Month! Elegant Mizuna! See Jill Ettinger’s article at Organic Authority for great info on 15 Bitter Herbs and why we should eat them! Congratulations on your Pumpkin harvests and Happy Halloween! Fall/Winter is SoCal Brassica time! Most of the time when we think of Brassicas we think of the big ones – Broccoli, Brussels Sprouts, Cabbages, Cauliflower, Kale. These are the backbone of your winter garden! But there are lots of littles too! For a more mild taste, plant bok choy, kohlrabi, arugula, mizuna, watercress, young turnips and radishes, and Napa cabbage. Otherwise, go for those dark green kales, mustard, rutabaga and turnip greens! Mixes rule! Plant several varieties for maturity at different times and to confuse pests. Pests are attracted at certain stages of maturity. They may bother one plant but leave others entirely alone depending on temps and the pest’s cycle! There are less aphids on broccoli when you plant different varieties together. See Super SoCal Fall Veggies Varieties, Smart Companion Plantings! Peas are the trellis plant of your winter garden! Or, plant bush peas in cages for quick peas; get an early variety and you will have them even sooner! Pole peas grow taller and longer, for a couple of months harvest. They usually don’t live the whole season, so it’s common to plant more than one round, once a month is good. Oh, and plant seeds, plus transplants of bush and pole all at the same time for them to come in one after the other. Your bush peas will produce first, then your pole peas, and likely your seeded peas will follow in short order. Soon as those bush peas are done, clip off the plant, leaving the roots with their Nitrogen nodules in the ground to feed your soil. Plant again, either from seeds or transplants, depending on when you think you will be wanting more! Generally transplants are six weeks ahead of seeds. Peas are shelling, snap or flat! Shelling means you eat the pea itself. Grow petites or fats. Yum. Snap is shell and all. Rarely do they make it to the kitchen. Flat is the same as Chinese or snow peas. String ’em or buy the stringless variety, and eat ’em right there, toss a few with your salad, steam or stew, add to stir fry! Try some Golden Sweet shelling peas this year! They can also be eaten young like flat peas! Love those mauve-purple blooms! Carrots enhance peas! Plant carrots around the cage or along the trellis. PreSprouting peas is super simple. Paper towel on plate, lay out peas an inch apart, fold the paper towel, spritz with clean water, keep them moist. By +/- 5 days they will have sprouted. Get them into the ground, carefully so you don’t break the little roots. Peas are winter’s legume. They and green manure mixes – legumes and oats, feed and replenish your soil because they take N (Nitrogen) out of the air and deposit it in little nodules on their roots! If an area in your garden needs a pep up, plant it to green manure. Plant it where next summer’s heavy feeders, like tomatoes, will be grown! Winter sports great root crops! Parsnips are related to carrots and both love cool temps! Carrots come in a multitude of shapes, sizes and colors! Kids love them. They do take awhile, so plant some Thumbelinas or Little Fingers for an earlier harvest! Pop in some Cherry Belle radish and a few long winter radishes like Daikon and White Icicle! Winter is a great time for long Cylindra Beets! Put in some early and smaller varieties to eat while you are waiting for the Cylindras. Early Wonder Tall Tops are a tasty choice, or red cold hardy Flat of Egypt! Try a yellow, Touchstone Gold! Yummy potatoes! Put in some Red Rose, Yukon Gold, Purple Majesty or your favorites. Try some heirloom French Fingerling potatoes! They have pink skins and yellow flesh with usually a little pinkish ring right under the skin. It is a great potato for roasting. Or Red Thumb Fingerlings with a bright red skin and pink flesh. Best boiled or roasted. A favorite among chefs. Chard comes in marvelous bright colors, the flower of veggie plants! Celery is upright and elegant, an in-the-garden edible let alone low calorie! Later on, lovely cilantro, celery and a carrot or two can be let to grow out for their dainty flowers, then seeds. Strawberry runner daughters can be clipped Oct 10 to 15, stored in the fridge for planting Nov 5ish. Remove any diseased soil where your beds will be; prep your beds with acidic compost like an Azalea mix. Commercial growers replace their plants every year. Some gardeners let them have two years but production tapers off a lot the second year. If you let them have two years, generously replenish the soil between the berries with acidic compost. Last year I laid down boards between the rows where my berries would be planted. The boards kept the soil moist underneath. I planted the berries just far enough apart that they self mulched (shaded the soil). Worked beautifully. I got the idea for the boards from a pallet gardener. OR. Check with your favorite nurseries to see when and what kinds of bareroot strawberries they will bring in this year. My local choice is Seascape, bred at UCSB for our specific climate. They are strawberry spot fungi resistant. They have long drought tolerant roots, up to 8″, so they can seek food and water deeper down, less water required. They need only an inch a week, a little more if your finger test shows they need it, or during hotter or windy drying weather. Some nurseries get other varieties of bareroots in Nov, some get Seascapes in mid January. They go fast, so make your calls so you can be there ASAP after they get them. Plant in super soil to get a good start! Clean up old piles of stuff, remove old mulches that can harbor overwintering pest eggs and diseases. Then add the best-you-can-get composts, manures, worm castings. In planting holes, toss in a handful of nonfat powdered milk in for immediate uptake as a natural germicide and to boost their immune system. Throw in a handful of bone meal for uptake at bloom time. If you have other treats you like to favor your plants with, give them some of that too! Go lightly on incorporating coffee grounds either in your compost or soil. In studies, what was found to work well was coffee grounds at only 0.5 percent of the compost mix. That’s only 1/2 a percent! See more details about soil building! If you have containers, dump that old spent stuff and put in some tasty new mix! Winter watering in drought times is the same as for summer. Before 10:30 AM, after 4 PM. Watch which way water flows along the leaves. Some plants it flows to the center stem. Some drip water off the leaf tips in a circle around your plant, the dripline. Still others go both ways. Make berms just beyond where the mature plant’s water flows. If at the dripline, that’s where the tiny feeder roots take up moisture and nutrients. That’s why they call them feeder roots! If your garden has a low spot, plant your water loving plants – chard, lettuces, spinach, mizuna, mints – there or near a spigot. Brassicas, Peas – Mildews, White Fly, Aphids/Ants. Right away when you have the 3rd, 4th leaves on seedlings or when you plant transplants, give your plants a bath. It’s a combo of disease prevention, boosting the immune system, and stimulating growth! The basic mix is 1 regular Aspirin, 1/4 c nonfat powdered milk, heaping tablespoon Baking Soda, and a teaspoon of dish soap. Even old tired plants will perk right up!If Whiteflies and aphids/ants come along, give them a bath too! Get a good grip on your hose and wash them away when you first see them. Be sure to get hideaways under the leaves and in crevices! Biodiversity In general, avoid row planting where disease and pests wipe the plants out from one to the next to the next. Instead, plant in several different spots. If you can’t help yourself, because your family always planted in rows or that’s the way farm pictures show plantings, remember, this is YOUR garden! Also, leave room so mature plants’ leaves don’t touch. Give them room to breathe, get good big leaves that get plenty of sun and produce lots more big leaves and many big fruits! Stunted crowded rootbound plants just don’t perform as well and are more disease and pest susceptible. Keep up with your maintenance. Weed so seedlings aren’t shaded out. Thin carrots, beets, cilantro, arugula, onions, any plants you overplanted, for salad treats! If you decide your plants need it give them a light sidedress of liquid feed, fish emulsion (if you don’t have predators) or a tasty tea mix – compost, worm castings, manure. Give your berms a check. Restore or add, shift as needed. Before wind or rain, double check cages and trellises, top heavy plants. Stake them, tie peas to the trellis or cage. Start gathering sheets, light blankets for possible cold weather to come. Have it in the back of your mind what summer plants you will be wanting, where you will plant them. Plant more permanent plants like a broccoli you keep for side shoots (All Season F1 Hybrid), a kale that will keep on going, where they will not be shaded out by taller indeterminate summer tomatoes. Already be thinking of Santa Barbara’s January 29 Seed Swap! Start sorting and labeling seed baggies on coming cooler indoor evenings. The last Saturday of January every year is National Seed Swap Day! This year that happens to also be Chinese New Year of the Rooster, January 28! Look in your area for an event, and if you don’t find one, collaborate with your local garden club or permaculture group to get one going! Seed sharing in California took a major step forward on Friday when Governor Jerry Brown signed into law the California Seed Exchange Democracy Act, an amendment to the California Seed Law. It’s the latest victory in a global movement to support and protect seed sharing and saving. See the entire October 2016 GBC Newsletter! October is a Fine Fall Planting Month! Recipes! Get Ready to Eat Tasty Warm Winter Meals! Events! Permaculture talk & Book Signing with Starhawk, Lane Farms Pumpkin Patch! Happy Halloween! January 29 Santa Barbara SEED SWAP! See the wonderful September images at Rancheria Community Garden! August Harvest, Seed Saving, Fall Soil Prep! Keep harvesting, it keeps your plants producing! Canning, freezing, fermenting, storing, drying are on the agenda! Check up on your winter squashes to see if they are ready to harvest and store. It’s Seed Saving time! Though crazy busy with harvests, gardeners have fall planting on their minds. Among HOT August days, there are ones that have a hint of fall. Days are a tad shorter; shadows in different places now. As summer plants finish, nursery bed areas are becoming available. The soil is being prepared for first fall plantings now through mid August, especially from seed! Often these special nurseries are made in semi shaded areas, seedlings to be transplanted as they get bigger as spaces become available. Plant your seeds far enough apart to get your trowel in to pick up your little plants to move them one by one to their new homes. Some are planted under finishing plants to take the finishing plant’s place, like peas under beans. Pop in some baby kale or cabbage between the tomatoes and peppers. Safe in a greenhouse is wonderful too! Already, get your seed packs for celery, chard, mustard greens, parsley, peas, winter radish varieties, and Brassicas if we don’t have Bagrada Bugs: cabbage, brocs, Brussels sprouts, collards, cauliflower, kale babies, kohlrabi, turnips. See Super Fall Veggies for help on choosing the very best varieties and Fall companion planting! Winter plants that get a good start while there is still some heat, will be producing a lot sooner than plants started while it is cooler, and you will have a much earlier crop. Be sure to leave space to plant additional rounds to keep steady table supply. If you have Bagrada Bugs, wait until cooler October, when the bugs are gone, to plant Brassicas. That includes arugula, mustards, radish. See more about Bagrada Bugs management. If you don’t have time to fuss with seeds, will be away at the critical time, keep harvesting, do your soil preps, and wait for September or October transplanting. Labor Day weekend is a favorite big planting time for many gardeners, and that’s only a month away now! At that time you can plant both seeds and transplants for two rounds at once, the seeds coming in six weeks after the transplants! Summer plants you can still plant for early fall harvests, are beans and early maturing determinate tomatoes and corn. Corn is more disease prone at this time though. Tuck in your year-round fillers, beets, bunch onions, carrots, summer lettuces, winter radish, to keep a colorful variety for your table. Give your late favorite summer/fall heavy producers you are keeping a good feed (sidedress). Eggplants have a large fruit, beans put out a ton of beans, tomatoes are big and working hard, peppers can be profuse! They like a tad of chicken manures scratched in, bunny poop and straw (pick up at Animal Shelters), well aged horse manure and compost makes them dance with the faeries in the night time! Fertilizers highest in P, Phosphorus, keeps blooming and fruiting optimum. Peppers specially like a foliar feed of non-fat powdered milk (Calcium) and Epsom Salts (Magnesium & Sulfur). They also can use more Potassium. This time of year kelp meal is good source and releases quickly. If you have predators about, don’t get the kind mixed with fish emulsion. For deeper root feeding, use a spade fork to make holes about your plant. Push it into the soil, wiggle back and forth a bit, then pour a tasty compost/manure/worm tea down the holes. That will feed at root level and give the soil organisms something to think about! Keep your watering steady out to the dripline to avoid slowing or stopping production or having misshapen fruits – that’s curled beans, odd shaped peppers, catfaced strawberries. Keep your soil moist. In hot late summer weather water short rooted high production plants like beans, cucumbers, lettuces and strawberries more frequently. Keep them well mulched, especially the cucumbers. Keep them off the ground to protect them from suffering wilts fungi. I put down straw 1″ deep. You want the soil covered, but able to allow airflow, dry up the wilts. In our hot foothills and further south, watch your melons, big squashes and pumpkins for their best harvest time – when their stem is brown and dry, or they ‘slip’ off the vine. Hold off irrigating melons about a week before they will ripen so their sugars will concentrate. Harvest okra while it is small and tender – bigger is NOT better! Let your winter squash harden. When you can’t push your fingernail in it, it’s ready. In the cool of summer evenings design your fall garden! Move plants from the nursery area as space becomes available, but have a plan too. Tall plants, trellises, to the North or on the shady side, then plants of graduated sizes to the South or sunniest areas. Peas need a string or wire trellis for their tiny tendrils. They aren’t like beans that twine anything. Few winter plants need support, but big brocs, tall kales sometimes need staking. If they ‘lay down,’ if you have the room and want more plants, they will grow baby plants along their stems! Otherwise, put your plants back up and stake them securely. Build your new raised beds. Install gopher barriers! Think soil, soil, soil! When an area is done, clear away insect hiding places. Remove and throw away any mulches from under where diseased plants were. If your soil is high for the area, plants there were diseased, and you have plentiful compost, maybe remove the couple top inches of soil and generously lay on some of that tasty new compost! Dig it into the top 4 to 6 inches. Amend your soils per the plant that will be grown in the area per your design. Strawberries need acidic compost IN the soil. Keep turning your fall compost pile, start one if you haven’t! This warmer weather will help the pile decompose faster, and your plants will be blessed when you give the compost to them! If you aren’t hot composting, remember, thin layers and smaller bits decompose faster. The ratio is 1 wet/green to 2 dry/brown. Throw in whatever kitchen trim, torn tea bags, coffee filters/grounds, crushed eggshells – anything worms can eat will decompose faster. I’m talking faster because starting now is a little late, so this is what you do to ‘catch up!’ Sprinkle with a handful or two of living moist soil to inoculate your pile, and add handfuls of decomposer herbs like comfrey, yarrow, chamomile. Turn it as often as you can to aerate and keep things humming. Vigorously shovel chop into smaller pieces as you go. Once a day if possible, but do what you can. I do mine anywhere from three days to every two weeks as I have time. Compost improves your soil’s water holding capacity and adds and stabilizes N, Nitrogen! Yes! Seed Saving! Allow your healthiest top producers to seed. Seeds are your second harvest! Each year keep your best! Scatter some about if they would grow successfully now! Or just scatter them about and when it’s the right time, even next spring, they will come up. Store your keepers in a cool dry place for next year’s better than ever plantings. Remember, these seeds are adapted and localized to you! If you are willing, take your extras to a local Seed Bank or Seed Swap! While you are there, pick up some of your fall favorites and some new ones to try out! How to Save Tomato Seeds! Happy Late Summer Gardening, My Friends! See the entire August GBC Newsletter! August! Harvest, Seed Saving, Fall Soil Prep! Veggie Seed Saving Plant by Plant! SoCal Fall/Winter Veggie SOIL Tips for Delicious Returns! The Veggie Gardening Revolution Continues! …and wonderful images of Pilgrim Terrace Community Garden in July! I know these are not veggies. What I want you to see is the roots. Healthy, opened out, pointing down, not rootbound. These little guys will get a good start. Many wouldn’t think how you transplant your veggies would make much difference, but it can! Here are some tips for smoothing and soothing that step in your gardening for your plants’ health and the soonest harvest! Rather than popping your transplants out of the six pack and stuffing them into the ground unceremoniously, throwing some water at them, 5 minutes and you’re gone, consider enhancing that process! It’s an investment. Think how big that root ball will get and generously give the planting spots some wholesome nutrients. Remember, also, hungry micro feeder roots grow laterally searching for food, like from naturally decomposing leaves and insects, so make your planting hole a little larger than that – at least out to the dripline of the mature plant! Do as nature would do. Put your plant fuels right where they will be used, right in that planting hole! Throw in compost, what you estimate to be 5% organic matter by weight, 10% by volume if that area hasn’t had compost added recently. Be sure that is acidic compost for beans, celery and strawberries. Add 3/4 cup or so of chicken manure (or your choice), a good handful of bonemeal, handful of nonfat powdered milk and maybe a little bit of landscape mix from Island Seed & Feed bulk bins. Coffee grounds help prevent soil diseases. Could put in 1/4 C or less of them – go very lightly, all that is needed is 1/2%! That’s not a typo! Compost and manures add N (Nitrogen), necessary for growth. Bone meal is high in Phosphorous (for blooming) and takes 6 to 8 weeks before it starts working – perfect timing! It is also high in calcium, which helps prevent blossom end rot in tomatoes. Nonfat powdered milk, also high in calcium, is for immediate uptake, a natural germicide and boosts the immune system. 25% Worm castings is research approved as optimum. Worm castings have special plant-growth hormones, improve water holding capacity, suppress several diseases and significantly reduce parasitic nematodes, aphids, mealybugs and mites. They are not fertilizer. If the roots of your transplant are jammed up a bit, gently pull down their little legs, spread them out in four directions. Dig your planting hole wide and deep enough that you can make a little cone of soil in the bottom. The longer roots will dangle down around the cone, happy to be in their natural direction, already starting to be able to reach for deeper soil nutrients and moisture. Some gardeners trim or cut off any extra long roots rather than have them curl and fold. It’s better to dig a deeper hole and leave the roots intact rather than lose time in ‘transplant shock’ recovery. If you do trim the roots, also trim the canopy because now that there is less root, the canopy is too large for them to feed properly. Clearly you can’t do that with a plant like corn. Selecting Transplants to save money! Not everyone wants to plant from seed! Not everyone wants to spend a ton of bucks on transplants either! Ok, so do it John Kohler style! See this video of him separating out ELEVEN lemon cucumbers from one 4″ container he purchased for $1.79 (those were the days, ha, ha) ! I didn’t believe it, but he did it easy! And I’ll bet they all grew! You can use this technique with many plants. 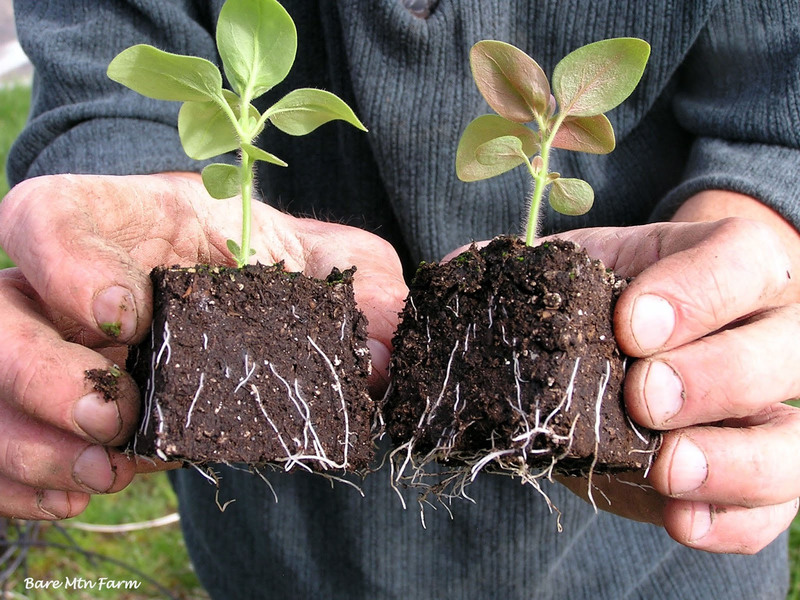 Sprinkle Mycorrhizal fungi right ON the roots of your transplants when you put them in the ground. Gently pat it on so it sticks. It increases uptake of nutrients, water, and phosphorus that helps roots and flowers grow and develop. The exception is the Brassica family – for example, won’t work on broccoli, kale, turnips, radish – save your time and money. Ask for it at Island Seed & Feed in Goleta. If you have a spritz bottle handy, spray the roots and saturate the planting hole with hydrogen peroxide. It gives the little guys a boost of oxygen, uptake of nutrients, kills many disease causing organisms, pests, algae, fungus and spores. H2O2 Important details! It may take some getting used to these next two ideas… 1) When you install your transplant, add soil in gently and water as you go. Let the wet soil flow into the spaces so your plant has soil contact and it can eat. 2) Especially don’t tamp down the soil with your foot because it may break some roots, slowing your plant’s growth. Compacting your soil presses the oxygen out of the soil and soil needs to breathe. Channels for soil organisms are closed – they can’t get around and closed water channels deprive your plant of deeper moist soil! Leave your soil light and loose! Be sure where your water will flow. Use trenches, basins/wells, mini berms, to keep it where you want it, where it is needed. For plants like melon or winter squash, put a stake in the center of the basin where the seeds or transplants are, so you can water right where the roots are. As your super healthy plant matures, finding where it starts is often lost among prolific monster foliage. Time to time, restore the basin. The rest of the soil doesn’t need watering. Good hot soil keeps those melons and squash producing and dry soil grows less weeds! After your transplants are in the ground, give them an Aspirin+ bath! Yup. One Aspirin, 1/2 teaspoon liquid dish soap (surfactant), per gallon of water. While you are at it, add a 1/4 C nonfat powdered milk and a heaping Tablespoon of Baking Soda as well. Aspirin, triggers a defense response and stimulates growth! As stated above, powdered milk is a natural germicide and boosts the immune system. Baking Soda makes the leaves alkaline and inhibits fungal spores! Use especially on your young bean plants, all your cucurbits – cukes, zuchs, any mildew prone plant. Use a watering can that has a rose (nozzle) that turns upward to get the undersides of leaves as well as their tops. Especially do this for tomatoes! Sometimes I plant one day, give the new babies their treatment the next, depending on how much time and energy I have, how many plants I need to plant. Special treatment for Peppers! Rather than in the soil, do foliar sulphur, Epsom Salts! A cheap home remedy that can keep plants greener and bushier, enhance production of healthier fruit later in the season, and potentially help reduce blossom-end rot. You could apply 1 tablespoon of granules around each transplant, but research has shown a foliar spray of a solution of 1 tablespoon Epsom salts + a 1/2 teaspoon of liquid dish soap (the original plain Dawn) per gallon of water at transplanting, first flowering, and fruit set is quite effective! As a foliar spray, Epsom salts can be taken up quickly by plants, otherwise, it is sometimes hard for the plant to get it out of the soil because of calcium competition. Last, if it is warm weather, if your soil has the wilts/blight fungi, top off the soil around cucumbers and tomatoes with soil feeding mulch. Straw is simple. Apply it no more than 1″ deep, enough to allow some airflow. Mulch keeps tomato leaves from picking up wilts from soil. It keeps cucumbers, winter squash and strawberries up off the ground, less susceptible to insects and rot, keeps fruits clean. See more tips about planting in fungi infected soil – tomatoes and cucumbers especially! With bigger plants, plant an understory of living mulch! That can be two-for-one edible companion plants that enhance, repel pests and/or diseases, or a legume cover crop that feeds your soil while your plant grows! An understory of edible plants like lettuce, carrots, beets, are a wise use of space – no need for a special bed for them. As your bigger plants make shade, remove the lower leaves so the littles get enough light. Legume cover crops save time by feeding your soil while your primary crop is growing! White Clover is a good choice. See more on Living Mulch. Don’t forget to put down an organic snail/slug bait a couple times BEFORE you plant an area, or you may not have plants the next day. If you live in a bird area, cover your new planties with bird net, aviary wire, row covers or a wire cloche. Make your cloches quite big – healthy plants grow pdq, pretty d— quick! Soon, very soon, put up trellises by beans and cukes, and install sturdy cages for tomatoes and peppers. Going vertical gives you more space to plant, and keeps fruits clean up off the ground, they ripen all the way around, are free of soil diseases and ground crawlies! Convenient picking height too. Eat ’em as you stand there! Planting Seeds! Do your soil preparations the same as for transplants! Worm castings are especially good for seeds! Seeds germinate more quickly, seedlings grow faster! If you aren’t putting in your seeds at the same time as you do your soil prep, stake the center of the spots where the seeds will go so when you plant their roots will have maximum opportunities for tasty nutrition! If it will be a bed, stake and label the areas for each kind of seed so you plant in the best places for each. Again, lay down that snail/slug stuff a few days before you plant. Do it twice to get the generations. If you miss that step, then put it down right when you plant. Otherwise you may think they never came up. Soil predators feast overnight. Stake the area where the seeds are so you don’t over water or step in the bed and compact the soil, damage delicate seedlings before you can even see them. Cover the area if you have birds. Seeds are tasty, tiny sprouts are a delicacy. Water gently, set your water wand on the fine mist setting, so your seeds stay where you put them and aren’t uncovered; keep them moist until they are up. When your little ones are up about 3, 4 inches, give them their aspirin+ bath, mulch them, promptly install their trellises and cages.